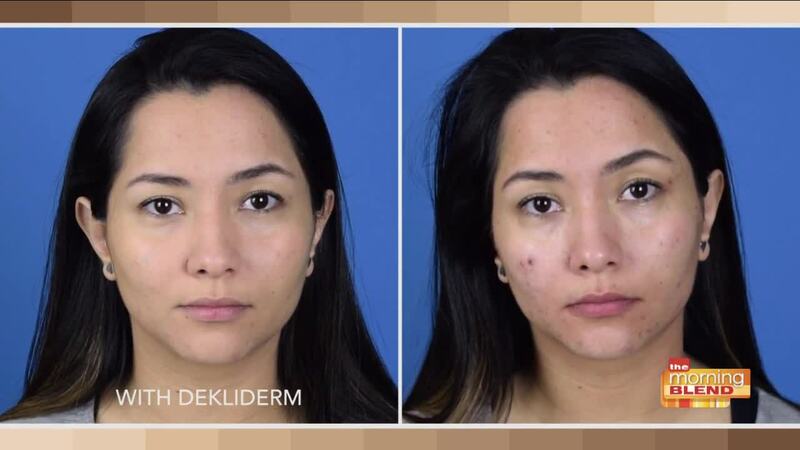 "Dekliderm is a revolutionary new liquid foundation that goes on white and instantly self-adjusts to match your EXACT skin tone. Our unique color-matching formulaprotects and moisturizes the skin as it works to even out your complexion. Dekliderm™ foundations contain SPF 50 sun protection to shield your skin from harmful UVA and UVB rays. It is designed for daily use and will give your skin that illuminating silky finish other foundations just don’t provide. Benefits – What makes Dekliderm different? Self-Adjusting Foundation – Our unique color-matching formula protects and moisturizes the skin as it works to even out your complexion. Dekliderm Self-Adjusting Foundation contains SPF 50 sun protection to shield your skin from harmful UVA and UVB rays. It is designed for daily use and will give your skin that illuminating silky finish other foundations just don’t provide. Our fragrance-free formula is lightweight and quickly absorbs onto the skin without any dryness or caking. 1 - Apply Dekliderm Self-Adjusting Foundation to clean, dry skin. 2 - Using a circular motion, liberally distribute product on face until desired coverage has been achieved. 3 - Apply evenly and generously before sun exposure. 4 - Reapply at frequent intervals to maintain protection. 5 - Immediately reapply after swimming or perspiring. Q: Does it work well on very dark skin? A: Unfortunately, for very dark skin color, the SPF will not fully match your skin type since it’s white in color and will not fully fade into rich dark pigment. Q: How does the primer work to reduce the appearance of wrinkles? A: The primer contains clinically studied ingredients that have been shown to brighten your complexion and help reduce the appearance of fine lines and wrinkles. One of the ingredients has been shown to help minimize the appearance of fine lines in as little as 24 hours. Q. What is self-adjusting foundation? A: Dekliderm is a moisturizing foundation with SPF 50 that instantly adjusts to your skin tone as it is applied and blended into the skin. Q. How should it be applied? A. Apply liberally to clean and dry skin. Blend until evenly and fully absorbed. Q. Which shade is best for my skin tone? A. Dekliderm is available in two shades. Light is for fair to neutral skin tones. Medium is for beige to sun-kissed skin tones. Q. Is Dekliderm fragrance free? A. Yes, Dekliderm is fragrance free. Q. Is Dekliderm paraban free? A. Yes, Dekliderm is paraban free. Q. Where is Dekliderm made?